The pangolin is one of the world's strangest-looking wild animals. Found in Africa and Asia, it has a large muscular tail and is covered with armor-like overlapping scales that protect it when it is threatened and it forms an impenetrable armored ball. It lives in both rain forests and savannah grasslands. Little studied, they are natural pest controllers, gobbling up ants and termites. Pangolins are similar in shape to anteaters and are armored like armadillos. David Attenborough wrote: they “protect themselves with armor” made up of “roughly triangular horney plates that overlap one another like the scale son a fir cone. The pangolins are so specialized that they can now eat nothing but ants and termites for their jaws have lost all their teeth and little more tham a curving tube housing a very long tongue. Several species of them spend their lives in trees and clamber about with the aid of a long grasping tail. 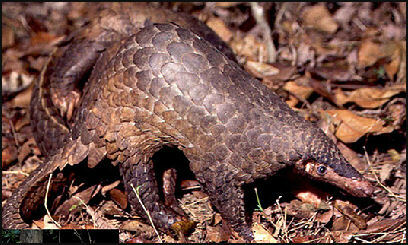 There are seven species of pangolins dispersed but uncommon over southern China, Southeast Asia, Indonesia and Africa. They range in size from two kilogram tree-dwellers to a 30-kilogram. 85-centimeter-long pound African species. The most common species, the Cape pangolin, reaches lengths of 110 centimeters with about half of that being tail. It spends its time entirely on the ground. The Chinese pangolin of east and south Asia weighs two to seven kilograms. Its body and head is 54 to 80 centimeters long. The tail is 24 to 36 centimeters long. It pale, yellowish scales are up to five centimeters across. The Cape pangolin of eastern and southern Africa weighs 15 to 48 kilograms. Its body and head is 50 to 60 centimeters long. The tail is 40 to 50 centimeters long. Pangolin meat is a prized delicacy and pangolin scales are greatly sought after for traditional medicines. Their skins are used in making shoes and boots. Between 1980 and 1985, 175,000 pangolin hides were imported into the United States, The practice has since been discontinued. Pangolins have short legs, a long snout and a thick prehensile tail. The head is small and cone-shaped. The ears are small. Even average size pangolins have a very long tongue that can extend 40 centimeters beyond its mouth, allowing them to reach deep into ant and termite nests. The animal has no teeth and its lower jaw is just slivers of bone. Its powerful stomach muscles “chew” its food. Pangolins are covered in armor made up of horny plates, which overlap like shingles in a roof. The armor serves as camouflage as well as proving protection. The pangolin’s underside is naked except for a few sparse hairs. On Chinese pangolins and other species the snout, cheeks, throat and inner limbs are also not covered by scales. When it is rolled into a ball none of the soft areas are exposed. On each of forelegs are three long claws (extensions of three of five toes). They are used mainlt to dig out holes in ant and termite nests. The claws on the hind legs are shorter. The pangolin’s claws and prehensile tail make it both a powerful burrower and agile tree climber. Pangolins are around insects a lot and don’t seem to mind having them crawl all over their bodies. They have special muscles in their nose and eyes to close off these sensitive areas. Sometimes they will open up their scales and let ants climb on their skin, apparently to let them consume irritating skin parasites. Pangolins are solitary, nocturnal animals. They sleep during the day in burrows (sometimes as many as 70 different ones scattered over a large territory). They can walk on their hind legs but most move along on all fours. When a pangolin is threatened or attacked it rolls up into a ball---with its head sandwiched against its stomach and its muscular tail wrapped around its body---and emits an unpleasant smell like a skunk. Not even a lion or tiger can not pry one open. Pangolins also escape predators by climbing trees, digging into burrows and even forming a ball and rolling down hills---one of the few examples of wheel-like locomotion in the animal kingdom. Pangolins can swim. Some say pangolins like to take a swim after a meal of ants to clean off parasites on their bodies. Female pangolins usually give birth to one offspring after a 120 day gestation period. A Pangolin tongue is so long that one end of it is attached to animal’s pelvis. Ants and termites are collected with sticky mucus on the tongue and swallowed. Pangolins "chew" using the abrasive walls in their stomach and pebbles they have swallowed. Pangolins, numbats from Australia, aardvarks from Africa and ant eaters of Latin America all have long sticky tongue used for collecting ants. These species, all from different animal groups, developed their tongues independently. Describing the mechanic of a feeding pangolin, David Attenborough wrote: “A pangolin in search of a meal opens a termite nest with a slash of the claws on its front legs, and pokes its curved snout inside. Angry termites will swarm out to defend their colony but the pangolin is little affected. It presses its horny scales firmly against one another, it keeps the lids of its eyes, which are particularly thick, tightly shut and it closes its nostrils with special muscles. It then protrudes a long black tongue which is liberally anointed with a sticky spittle that pours from an enormous salivary gland housed in its chest. This tongue snakes into the wrecked galleries of the ant’s nest, collects the insects and, flicking in and out, carries them back to its snout. There they are immediately swallowed and mashed up by the horny lining of the muscular stomach. The giant African pangolin can consume as many as 200,000 insects in a single night. Pangolins have been observed turning over cow patties to get at the termites and breaking open patties and feeding on insects that fell on their stomachs. The trade is driven primarily by two countries: Vietnam and China. Notably, these two are also the primary drivers of the illegal trade in rhino horn and play a major role in tiger and ivory trade as well. "Despite China being a party to CITES, the bulk of the pangolins taken from the wilds in Southeast Asia have illegally entered into China unchecked," says Shepherd. From fields and forests to Chinese cooking pots and medicine vials, the industrial-scale trade is propelled along similar trafficking routes for tigers, turtles, bears, snakes and other mostly endangered species across Asia, all driven by a seemingly insatiable demand for often dubious medical remedies, tonics and aphrodisiacs. "We are watching a species just slip away," says Chris Shepard, who has tracked wildlife trafficking in Asia for two decades. He says a 100-fold increase is needed in efforts to save the pangolin, sometimes described as a walking pine cone. In 2013, year a chef surnamed Wang told AFP that his restaurant sold pangolin for 2,000 yuan per half kilo, adding: "We usually braise them, cook it in a stew or make soup, but braising in soy sauce tastes best." Pangolins are protected by the international wildlife trade treaty CITES, to which Beijing is a signatory. But in parts of China they are prized by new mothers hoping to produce milk, and have become the focus of a vast smuggling industry stretching across Southeast Asia - estimated to traffic tens of thousands of the animals each year. By the early 2000s, supplies in Thailand were drying up, as evidenced by the development of an unusual barter trade: Thai smugglers would give insurgents in Indonesia's Aceh province up to five AK-47 rifles in exchange for one pangolin, according to the International Crisis Group, which monitors conflicts globally. The pangolin trade - banned in 2002 by CITES, the international convention on endangered species - resembles a pyramid. At the base are poor rural hunters, including workers on Indonesia's vast palm oil plantations. They use dogs or smoke to flush the pangolins out or shake the solitary, nocturnal animals from trees in often protected forests. "Everything is against them. ... They have no teeth. Their only defense is to roll up in a ball that fits perfectly into a bag," Shepherd says. Under stress, pangolins can develop stomach ulcers and die. Middlemen set up buying stations in rural areas and deliver the animals through secretive networks to the less than dozen kingpins in Asia suspected of handling the international connections. Factories in Sumatra butcher the pangolins, slitting their throats, then stripping off and drying the valuable scales. The smuggling routes almost all end in China, Shepherd says. Other destinations include Vietnam, the top wildlife consuming nation in Southeast Asia, and South Korea. Pangolins from Indonesia are sent to mainland Southeast Asia, then trucked up the Thai-Malaysian peninsula through Thailand and Laos to southern China. Chinese fishing boats ferry those from the Philippines directly to home ports. Smugglers in the eastern Malaysian state of Sabah ship theirs to Vietnam's seaport of Haiphong or to mainland Malaysia to join the trucking routes. From India, they pass overland through Nepal and Myanmar. Eight tons of meat and scales, worth $269,000, were found in the boxes at Jakarta airport and at a warehouse raided the following day. Four people were arrested. "I am trying hard to win the war," says Brig. Gen. Raffles Brotestes Panjaitan, Indonesia's top wildlife police officer, citing the July seizure. But he lists a host of obstacles: poverty, corruption, an inadequate force and weak international cooperation. The World Wide Fund for Nature Philippines said the Chinese vessel F/N Min Long Yu could have been carrying up to 2,000 of the toothless, insect-eating animals rolled up in the boxes, with their scales already removed. "It is bad enough that the Chinese have illegally entered our seas, navigated without boat papers and crashed recklessly into a national marine park and World Heritage Site," said WWF-Philippines chief executive officer Jose Ma. Lorenzo Tan. "It is simply deplorable that they appear to be posing as fishermen to trade in illegal wildlife." The boat's 12 Chinese crewmen are being detained on charges of poaching and attempted bribery, said Adelina Villena, the marine park's lawyer. She said more charges are being prepared against them, including damaging the corals and violating the country's wildlife law for being found in possession of the pangolin meat. It is not yet clear which of the four Asian pangolin species the meat comes from. The International Union of Conservation of Nature lists two as endangered: the Sunda, or Malayan, pangolin, and the Chinese pangolin. Two others, including the Philippine pangolin endemic to Palawan, are classified as near threatened. Alex Marcaida, an officer of the government's Palawan Council for Sustainable Development, Philippine authorities consider the Philippine pangolin threatened because of unabated illicit trade. He said the Chinese crewmen have said the pangolins came from Indonesia, but officials were still verifying the claim. The Philippine military quoted the fishermen as saying they accidentally wandered into Philippine waters from Malaysia. They were being detained in southwestern Puerto Princesa city, where Chinese consular officials visited them. The fishermen face up to 12 years' imprisonment and fines of up to $300,000 for the poaching charge alone. For possession of the pangolin meat, they can be imprisoned up to six years and fined, Villena said. Weighed against the profits, the penalties for trafficking are low. Not long ago, an entire pangolin could be bought in Indonesia for $5 or less. Panjaitan, the Indonesian official, says just the scales from an average-sized animal now go for about $275. The scales fetch up to $750 a kilogram ($340 a pound) in China.Panjaitan, the director of Investigation and Forest Protection in the Ministry of Forestry, hopes Indonesia will greatly stiffen its jail term this year for major forest encroachment - directly linked to harvesting of pangolins and other wildlife - to a maximum of 20 years. Although seizures and arrests of low-level smugglers have increased substantially, almost none of the major players have been put behind bars. And as Asian stocks vanish, Africa's three pangolin species have emerged as substitutes - a similar pattern to other traditional Chinese medicines, such as subbing lion bones for those of the now rare tiger. Still, Steven Galster, executive director of Bangkok-based FREELAND, a group fighting wildlife and human trafficking, points to some progress. Suspecting that a private zoo was a cover for wildlife trafficking, Thai officials charged Daoruang Kongpitakin in July with illegal possession of two leopards. Her brother and sister had been arrested several times for pangolin smuggling. Wildlife investigators are also tracking a shadowy company in Southeast Asia, which wields influence with both senior Lao and Vietnamese officials and could be among the region's biggest traffickers. ASEAN-WEN, a wildlife enforcement network of the 10 Southeast Asian nations, has also notched successes since its 2005 inception. Such developments across several countries could be a game changer, Galster says. "But will they move fast enough for the species to survive?"